Hello and welcome to part two of my Easter special on Mastication Monologues! Today I am going to be talking about a classic Korean noodle shop that my friend introduced me to for Easter lunch. Even though I’m far away from friends and family back home, I at least found a Catholic cathedral in Korea that I could go to to celebrate the resurrection of Christ. I was interested to see the Koreans’ take on mass since I have been to services in other foreign countries, and each nation has their own take on the Catholic rites. I went to the Myeongdong Cathedral in Seoul on a beautiful Sunday, and the Church was pretty impressive in size and design (Gothic, specifically). After mass, I didn’t have anything planned for this lazy Sunday since there strangely wasn’t anything Easter themed to do in a country that has tons of fervent Christians yet not even one type of Easter candy or colorful egg. So my friend, Steph, met up with me for lunch since we both were starving. 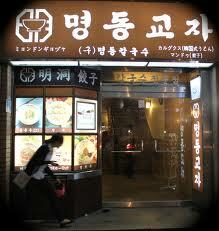 We ended up at Myeongdong Gyoja which is a Korean noodle house that has been open for over forty years in Seoul. 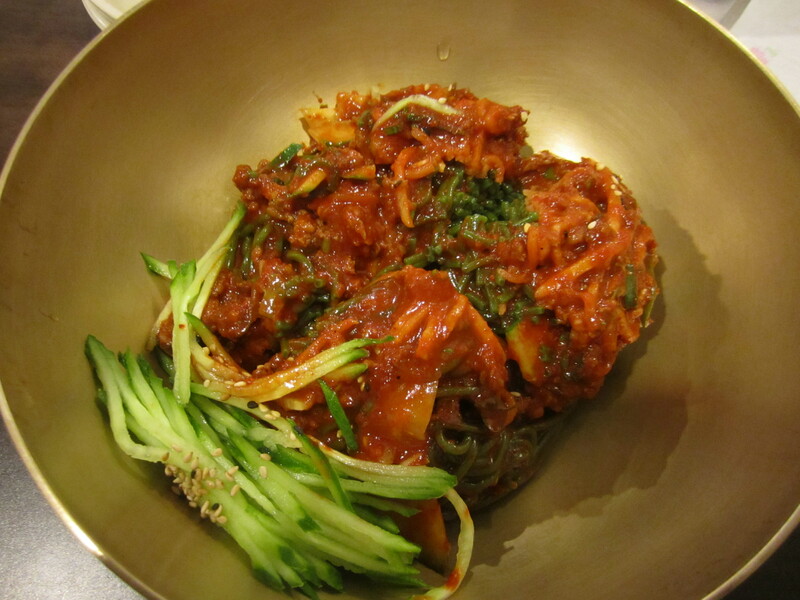 They are known for their kalguksu or hand cut noodles, and only have four to five dishes on their menu. Most of them are noodle broth meals, but they do offer steamed dumplings as well. Steph told me that their specialty was the meat broth option, but I saw the spicy noodle option (bi bim guksu). Obviously, I gave into my weakness for all things spicy and decided to give it a try. The service was very prompt in the extremely busy and semi-cramped restaurant. You also share tables with other diners if it’s just two of you, so just a heads up for those of you looking for a place to have an intimate conversation or want a bit more privacy while dining. It was 8,000 won upfront for the noodles along with some kimchi banchan, a bowl of beef broth, rice, and gum for the ubiquitous after-dinner breath in Korea. All of it looked very fresh and elegantly presented especially the noodles that were unlike any noodles I have seen before in Korea. They were a deep forest green! It didn’t really deter me much as I tucked into the verdant jumble of deliciousness. The noodles were very supple and thin and were thickly coated in red pepper powder and gochujang chili sauce. Plus, bi bim guksu is a cold noodle dish, so I was kind of caught off guard with the first bite. It wasn’t too spicy for yours truly, but every bite contained an undercurrent of cucumber notes that came from the cucumber slices that were hiding underneath the green tangle and the freshly julienned cukes on the side. By the time I reached the end of the bowl, I was filling up fast on the glorious noodles, but I had room for finishing off the kimchi. I’m going to say it now, but this was the first bowl of kimchi that actually was somewhat spicy. For some reason, the chili sauce they doused the cabbage in had a strange numbing-spiciness I could only liken to a Sichuan chili sauce I had at my friend David’s hot-pot dinner (See Drop It Like It’s Hot Pot). There was also a lot of garlic powder in it, hence the gum. I had two helpings of this fiery side-dish much to the surprise of one of the waitresses who went along scooping more into other diners’ bowls. So if you like spice, definitely check out the kimchi at Myeongdong Gyoja. As for the beef broth, it was very simple but intensely flavorful. I’m sure it was quite high in sodium like a lot of broths, but it tasted like I was biting into a succulent steak roasted by God on this holy day. Anyway, I give Meyongdong Gyoja the waygookin (foreigner) seal of approval if you want to try a piece of Korean traditional cuisine in a famous place or at least try some kimchi that lives up to its spicy reputation. Posted in Far East Asian Cuisine, South Korean and tagged authentic, beef, broth, Chinese, dining, dumplings, Food, garlic, gochujang, hot, hot sauce, kimchi, Korea, noodles, peppers, restaurant, Reviews, rice, sauce, spicy, Travel. Bookmark the permalink.